The nearly 300 restaurants in the Times Square area offer a range of cuisines, from burgers and beer to champagne and caviar. Restaurant Row, stretching between 8th and 9th Avenues on 46th Street, is a magnet for theater goers, Broadway performers, and tourists alike. On June 3, the restaurants in the area had a show of their own: the annual Taste of Times Square festival. Local restaurants put their best food forward in tents set up from Restaurant Row to Times Square. With so many choices, it was impossible to sample everything, but below is some of the best we came across. The barbecued pulled pork in this slider was inducted into the Barbecue Hall of Fame before Guy Fieri ever became a celebrity chef. The pork is soft and chewy with hints of bourbon and brown sugar. Fieri said it was smoked for 8–10 hours—the woody hints were a testament to that. The warm, sweet, and savory pork was balanced with creamy, crunchy, and refreshing coleslaw. The slaw had a character of its own—keeping its shape inside the soft bun and making the slider easy to eat even in a bustling crowd. “This is some real barbecue,” Fieri said. 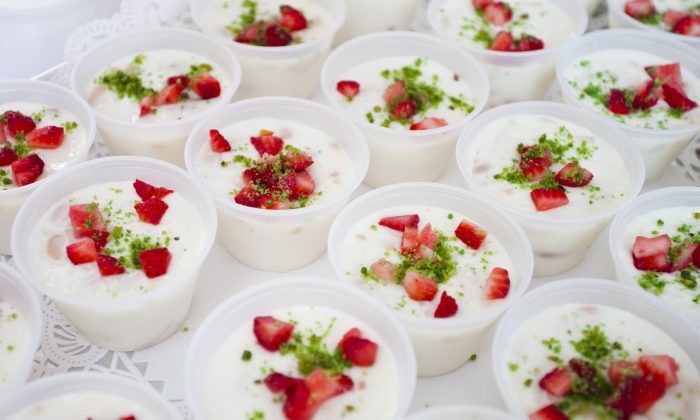 The almond pudding from Dervish Mediterranean is the coolest treat for the hot summer ahead. Sliced and roasted, the almonds float in a delicate cloud of milk custard. The treat is light and fresh. The strawberry and pistachio topping is a treat not only for the eye and the palate, but makes for a sweet and nutty finish. Lillie’s does right by the Irish culinary classic. The chopped meat is cooked perfectly in a tomato base and melts in your mouth with pops of flavor and color from the corn, peas, and carrots. The chef was piping the mashed potatoes onto each mini-pie using a pastry bag. The pie was then topped with hand-shredded parmesan. The cupcake sized offering carried a sharp and cheesy aroma and was a delight to dig into, spoonful after spoonful. The topping on these pudding slices looked so rich we had to take a step back before digging in, but it turned out just lightly sweet. The raspberry sauce was fresh and tart, balancing the creamy yellow English sauce, which was a wonder of its own—we licked off the plates when we were done. The bread itself was perfectly moist with a clean and buttery base. Chef Paul Denamiel, who crafted these perfect little desserts, just opened a new restaurant in the South Village called Little Prince. People lined up in the pouring rain for the family-sized servings of this Spanish rice. Adolfo Perez and his son Adolfo Perez Alvarez were at the festival cooking the rice and seafood in a giant pan. The rice was soft and the oysters and shrimp buttery. The paella had a hint of an ocean breeze and made us think of spending some time on the beach. These ribs are dry-rubbed with a mix of paprika and brown sugar, and slow roasted for six hours. They are coated with a “secret” sauce, which the chef said we’d have to come to the restaurant to taste again. And we just might: it was delicious and tangy, while the ribs were delicate and smokey. “Watching locals and tourists stop by our stand, try the amazing ribs and corn bread we were serving and exclaim that the food was fantastic, made for an incredibly rewarding day,” said E&E Grill House co-owner Eric Perlmutter. Da Rosina’s seafood salad was a hit at the festival—employees were bringing out new platters of it one after another. The simple dressing was made with lemon, olive oil, and ground black pepper and set the scene for the main characters: fluffy scallops, tender shrimp, and buttery octopus. The crunchy carrots and celery added a dash of color and balanced out the softness of the seafood.